With all due respect, defrauding the public with ridiculous bullsh*t is all they know, Mr President. 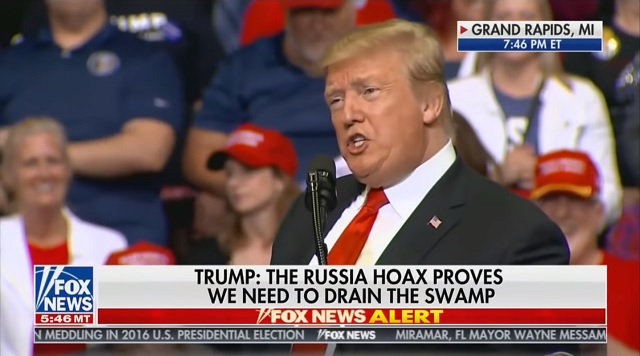 In his first major rally since Special Counsel Robert Mueller cleared him of any collusion with Russia, President Trump took the stage before a boisterous full house at the Van Andel Arena in Grand Rapids, Michigan, Thursday night -- and proceeded to tear into Democrats and the FBI as unintelligent "frauds" who tried desperately to undermine the results of the 2016 election. "The Democrats have to now decide whether they will continue defrauding the public with ridiculous bullsh--," Trump said to thunderous applause, "-- partisan investigations, or whether they will apologize to the American people." [...]Later, Trump vowed to "close the damn border" unless Mexico halts two new caravans he said have been approaching the United States rapidly. Trump also hit at fraudulent asylum applicants, saying liberal lawyers often have coached them in a "big fat con job" to claim they've feared for their lives when they make it to the border. The economy, Trump said to sustained cheers, "is roaring, the ISIS caliphate is defeated 100 percent, and after three years of lies and smears and slander, the Russia hoax is finally dead. The collusion delusion is over. ... The single greatest political hoax in the history of our country. And guess what? We won." I didn't watch it but I heard he talked tough on immigration and did not call for legal immigration "in the largest numbers ever" as he did at his previous rallies. I can't really bring myself to listen to him talking about getting tough on the border when he just signed a horrendous open borders he could have easily vetoed and demanded Republicans fix. While Trump's been failing hard on the immigration front (the situation is now worse than under Obama) he at least exposed the fact we have a shadow government and our media is a total fraud.